Yesterday morning we arrived in Panama City. We had a fast ride down the Pacific Coast from the the top of Costa Rica, and it is for this reason that we have neglected to update the site more often. We have been pedalling almost everyday in an effort to make to Panama City to rendezvous with my dad, John and our good family friend Niels...and to take off on the next adventure, crossing the Darien Gap. Very unfortunately, because of circumstances beyond anyone's control, my dad wasn't able to meet us here and he will be sadly missed on the journey as the route that we will attempt was very much his conception. But we will connect with him a little later on in South America! So, with only a quick glance at the giant skyscrapers that make up Panama City, we will take off (hopefully) this afternoon on a boat bound for the town of Jaque, which will be our last stop in Panama, and Central America. But, more on the this adventure soon... For now, stories about Costa Rica and Panama! When we take a minute to stop and reflect on our trip... Which, when riding in the bike I'll day, you tend to have time to do... One pretty incredible part has been meeting ups other friends and family along the way. A few months ago one of our best friends Nathan emailed us to say he would be in Costa Rica on a family vacation with his partner Sheetal. The timing was just about perfect to meet up! Then just a few weeks later an old friend Stephanie emailed to say she would be in Costa Rica around the same time. So within three days we got to see three good friends from home...we were overjoyed! Stephanie and her partner Shome came and met us in the oddly quiet town of Liberia and we had an excellent afternoon and evening catching up and reminiscing about times gone by. Then we pedalled to the beach town of playa del coco and waited for Nathan and Sheetal to arrive. When we finally connected, we piled into their rented SUV and explored some very rough back roads.... and what we thought would be some remote beaches.... We swam and snorkelled and had an amazing dinner (and hot shower) at their families rented place. It was only a day, far too short, and we felt very sad when the day was over.... But it was so Incredible to connect...and also thank you to Nathan and Sheetal for bringing us some much needed supplies! As you might recall, this was not our first time in Costa Rica. We were there in November for Glenn's brothers wedding... So we had a bit of a taste, and the knowledge that Costa Rica is little more developed and a lot more expensive. We decided to take the coastal route, which would be quicker than passing through the mountains. We went down the Nicoya Peninsula and then ferried back to mainland. For the most part the road conditions in Costa Rica were excellent, at times the roads lacked a shoulder, but it was never too much of a problem. There were some hilly sections, but these were probably the nicest as you would get views of ocean and jungle! A huge highlight of our time in Costa Rica was the wild life. We started riding early, usually by 6:30, and this was prime time for bird and monkey watching. Glenn was particularly good at spotting the money filled trees or the toucans hanging out... It was pretty incredible to see all of these animals! 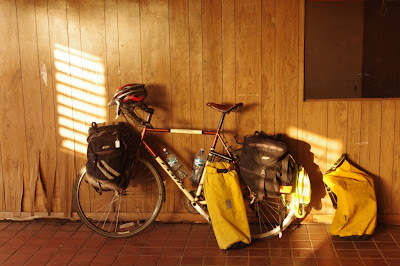 But, for us the cost, of food especially, was a big downside of cycling in Costa Rica. We did camp quite a bit to offset this cost, but our daily costs were quite a bit higher than they have been in quite a while. But... You can drink the tap water in Costa Rica... This was awesome! Then, all of a sudden we were in Panama. Somehow, we had made it to the last country in Central America and to, what we think is the mid way point of our journey. It kind of felt like coming home, everything was a little rougher and cheaper than in Costa Rica. Our time in Panama (which isn't over yet) has been pretty awesome, it is a very interesting and very diverse country. Unfortunately, for cycling there are not a whole lot of options, and no matter what route you take you always get funnelled back to the Panamerican Highway. Despite its limitations, for the most part the highway gave us a wide smooth shoulder, well graded hills, and friendly folks.... So it is hard to complain too much! When we got to Panama we also decided that we needed to tighten our money belts a little...we had been a little too loose about our budget and after almost nine months on the road this was starting to show. So we figured it was time to get creative about camping again, we started by asking at a fire station. We were floored by our reception, they welcomed us in, gave us a great place to camp, use of their kitchen, their bathroom, and fruit from their trees. When we were leaving they suggested that they stay at the fire station in the next town, so we did. This amazing trend continued as we worked our way down Panama...and we camped at FIVE fire stations! We decided that the fire stations are almost like little communes, a bunch of people all living in a common space and working together... And this is why we were so easily welcomed in. It might have helped that the fire men were a little bored, and we provided some mild entertainment. It is rare that the enormity of what we are undertaking actually hits us, but for me this happened when we crossed the Panama Canal. This incredible cut in land linking the Pacific to the Atlantic Ocean. We had read others' accounts of attempting to cycle across the bridge, saying the the traffic was too heavy, and they were forced to take a ride.... So we (read I) approached so the trepidation. But, we had made good time, and it was 10:00am on a Wednesday, so the traffic volume was low. We quickly pedalled up to the crest of the bridge, and it was at this point that I felt a little teary. We had crossed the length of two continents on our bikes. It is mind boggling, even for us! The flip-side, of course, is the knowledge that we have another continent to go, but we are so excited to reach South America, the Andes and Patagonia!